My kids adore sausage for breakfast and as a topping on their pizza. What I don’t like are the ingredients that are in breakfast sausage at the store. Poor quality meat, MSG, sugar, and other additives are the common offenders in your average roll of sausage. I just didn’t feel good about feeding this to my family anymore. Two years ago we purchased half of a pasture raised pig from a local farmer. I was excited about the abundance of bulk bacon, sausage, pork chops, and roasts that would be filling my freezer all year long. The very first morning after we picked up our order, I made some breakfast sausage feeling so proud that I would be feeding my children this high quality sausage. They took one bite and wouldn’t eat anymore. “It tastes weird,” they complained. To be fair, it did taste weird and not at all like our former breakfast sausage that we were used to eating. Sadly I had a huge amount of pre-seasoned sausage that I had to use all year long even though we hated it. It was just too much to waste. This year, I got smart. We still ordered our half pig, but instead of the butcher seasoning the sausage for us, I ordered it plain, determined to create a breakfast sausage seasoning blend that would taste similar to our old store bought sausage. I tried just salt and pepper. Too bland. Then I added sage. We were on the right track. Then I added some red pepper flakes for a little kick. Better. With each spice that I added, we got closer and closer to the flavor we were after. This is the blend that we are most happy with. I had all of the ingredients in my spice cabinet and it’s so easy that I now have the recipe memorized. It’s just one teaspoon of a high quality sea salt and then a quarter teaspoon of the rest. This has a bit of a spicy kick to it if you get a piece with a red pepper flake. We all like it like that at my house, but if you prefer a very mild sausage, you may want to cut the red pepper flake in half or omit. Let this be a guide to get you started, but feel free to experiment to suit your family’s taste. The good thing about this blend as well is that you can use it in any ground meat that you wish. 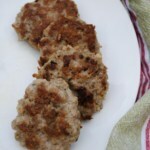 I haven’t tried them myself, but I would imagine that you could use them in ground pork, turkey, chicken, beef, or bison to makeover your breakfast sausage. A clean sausage seasoning to grace your breakfast table. Mix all seasonings together in a small dish. Sprinkle a little at a time onto the ground meat and mix thoroughly until all seasoning is incorporated. Use as you would normally use sausage in any dish. Thanks. Pork loin has been such a good buy this year and every time I go to the market I buy another one. Now I have turned it into something really fabulous. I have a grinder that attaches to my mixer, so I easily transformed it. I like the red pepper flakes, even added a dash mor. In the writing you say it is 1 tsp of salt and 1/4 tsp of the rest, but in the recipe the safe is also 1 tsp. Is the recipe the right one? I’m sorry I need to change the writing. The first time I developed this recipe I only used 1/4 tsp of sage. Since then I changed it to 1 tsp because I think it yields a better tasting sausage. If you find the 1 tsp is too much for you, lessen the amount next time. I personally like the sage flavor. Sorry, that should say Sage, not safe. Do you have any other seasonings or recipes for fresh pork from purchasing a whole hog? I too purchased it to avoid the junk pork you find in the store but I know my family won’t take well to the bland taste if I don’t figure out a great way to season it!! Can’t wait to try this breakfast sausage seasoning. Sorry, i overlooked it in the recipe. I see its one lb. Thanks. Thank you SO much for posting this. 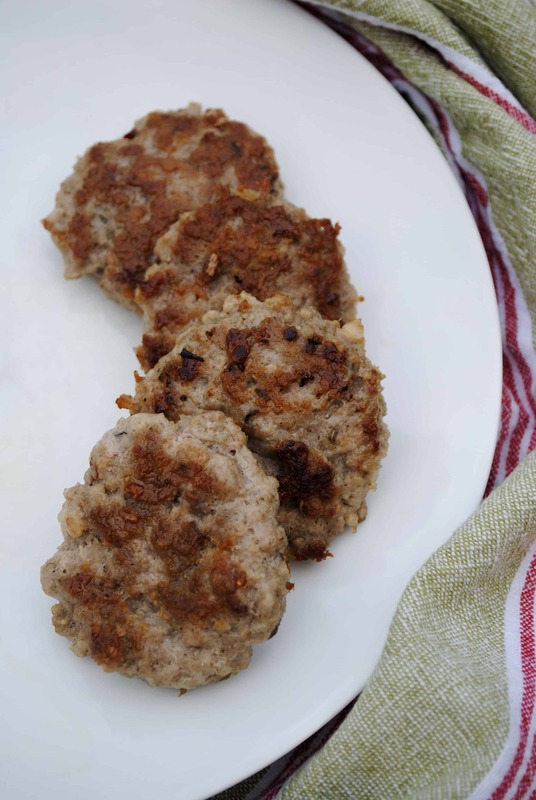 I have intolerances to msg, nitrates and nitrites, and nightshades, so I have been itching to make my own sausage…grew up on sausage pizza and loved going out for breakfast and still do! When i make this I’ll put red pepper in my husband’s and leave it out for mine. I am so touched that you are doing this great thing for your family! I don’t have children, but a mother’s love is so so beautiful!! !